Hilarious but harrowing, Danny Boyle`s Trainspotting charts the disintegration of their friendship as they proceed seemingly towards self-destruction. Mark alone has the insight and opportunities to escape his fate - but then again does he really want to "choose life"? Trainspotting is here released as a features-packed double disc DVD, with a collectors booklet and poster. Plot- Trainspotting is a 1996 film adaptation from the book of the same name by Irvine Welsh which was released 3 years prior to the film itself. I`ve read it myself and I`ve found it to be very confusing and disjointed and this is mostly due to it`s non-chronological order, particulary the first couple of chapters. The film version has been simplified for viewing audiences (for the most part, it went from A to Z) but lost none of it`s tone and style from the novel. 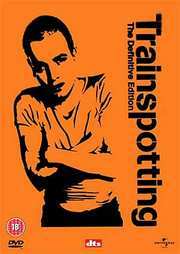 Trainspotting is a film about a junkie from Edinburgh called Mark Renton. He is desperately trying to kick the habit from taking heroin (skag, hash you name it!) after getting arrested by cops for stealing. Renton is put in rehabiliation and mixes his methadone with heroin and ends up in hospital. After going cold turkey (straight after leaving hospital) and hallucinating as a result from withdrawal of the Class A drug, Renton finally manages to come clean by coming to London. However, his so called junkie friends, Sick Boy and Spud as well as the volatile Begbie turn up in his doorstep to drag him back into the world of drugs and crime. Trainspotting is an electrifying film that is filled with liberal amounts of dark humour and an eclectic soundtrack. Such examples of this macabre humor includes the things that Begbie says right at the beginning of the film and the (in)famous, surreal toilet scene. As well as having a great amount of dark humour, the film can also be a very shocking experience in particular with the scenes involving hard drug taking. According to some people most notably politicians in this country, the US and Australia, they claim that Trainspotting glamourises drug taking while others opposes this view by claiming that there is nothing glamourous in taking heroin and the characters in the film aren`t doing them the world of no good. Since the release of Trainspotting, just about every college student at the time wanted to stick the (now) iconic posters, consisting of the cast in weird poses, in their rooms. Video- Presented in 1.85:1 anamorphic widescreen, the film has unavoidably aged a little. In my opinion, British films tend to look older than they really are these days and I suppose some British directors chose to keep this kind of image for purely artistic reasons as the look reflects the story. Despite this negative vibe, colours are generally vibrant although the image can have a slightly washed out look (possibly deliberate given the fact that it is supposed to be set in the late 80`s) and a little soft in some of the scenes and sharpness is well defined. There is however, lots of black specks that appear throughout the film but as I mentioned twice, that adds character to the film. Audio- The DVD gives us two flavours: you`ve got the standard DD 5.1 and the beefed up cousin DTS. There is little discernable difference between the 2 soundtrack as this is a dialogue driven film (don`t expect Begbie to unload his 6 shooter at Renton when visits him in London ;) ). Dialogue is clear throughout with no pops or hisses (it`s only over 1 decade old!). When the rear speakers do kick in, they are mostly used on music soundtracks from the famous pounding music of Iggy Pop`s Lust for life at the beginning to Damon Alburn`s Closet Romantic at the end. Some ambient noise is also heard on the rear speakers. Overall the sound department holds up well with the video department. Extras- Good but not great, the 1st disc has an audio commentary from actor Ewan McGregor, director Danny Boyle, producer Andrew MacDonald and screenwriter John Hodge. Despite what it maybe, it is not really an audio commentary (as none of them appear to be in the same room) but it is really a compilation of different interviews from 1996 as noted by Ewan McGregor. The commentary has been painstakingly made to fit what happens on the main feature. They do give a few interesting insights to Trainspotting but nothing awe inspiring. There is a few instances of dead air but the participants do go on right up to the end of the film. A typical cut and paste commentary or should I say interview clip. "The Beginning" featurette is made around the time of the films release. This features interviews with many of the cast and crew on their experiences in the production. It`s short but better than nothing. Your typical EPK, full of film footage and not a lot of interviews. Rounding off the contents of the first disc, there are 9 deleted scenes with optional commentary (not the live kind of commentary, this is same one as the `feature length` version i.e. done from interview clips from Boyle, Hodge and MacDonald). There are presented in letterbox format, in stereo and of poor quality which I`m not suprised since all deleted scenes are very grainy and sent to the cutting floor to rot. There is also an option to watch the deleted scene while watching the main feature (no seamless branching). It`s like the "White Rabbit" feature on the Matrix DVD. Moving on to the 2nd disc, we have 4 short featurettes, The Sound of the Film: Then, The Sound of the Film: The Look of the Film: Then and The Look of the Film: Now. The four featurettes speak for themselves and they are worth a look for their wealth of information. The Then featurettes interview Boyle and a few others at the time when the film was being made and the Now featurettes have the same people give their perspective of the film a few years later (the interviews were done in 2003). Next up we`ve got interviews with director Danny Boyle, producer Andrew MacDonald, screenwriter John Hodge and novelist Irvine Welsh. All the interviews aside from Welsh are recent interviews (recorded around Feb 2003). They share their views on the film itself and what they think of it now. Welsh`s interview (who has a cameo as the drug dealer who gave Renton the opium suppositories) is his view on the adaptation of his novel. It was recorded in the same which the film was made and unsurprisingly, the footage is in a pretty bad shape. My personal favourite of the 2 disc package is the `Behind The Needle' multi-angle featurette. This short but sweet featurette shows a behind the scene footage of the infamous shooting up scene of Mark Renton while he was at Swaney`s place. It was famous because it showed a close up shot of Renton jamming a syringe full of heroin and injecting it. The BBFC at the time felt it glorified drug use and removed the offending scene from video release. It has since enjoyed an uncut status on the recent DVD release (the previous DVDs are bare bones and cut as well). As you may know, just about no actor would like to stick something sharp into their arm (although the heroin in the film is actually saline) so what the crew have done is they used a prosthetic arm in the close up shots. There are 3 angles to choose from. The 1st angle shows director Danny Boyle looking and commenting at the aforementioned footage while it is running, the 2nd angle is the actual behind the scenes footage and the 3rd angle sandwiches 1 and 2. 'Cannes Snapshot' featurette and Cannes Voxpops are pointless since there is nothing much to learn there except reactions from many celebs including McGregor himself. The package is rounded off with a slideshow gallery (with Sleeper`s Atomic playing in the background) and trailers. Overall- I can only sum this up in three words: An exceptional film. Trainspotting is a triumphant and a cornerstone for British film making and no film has ever come so close to the hype. Trainspotting is a film liberally filled with black humour, spot on mesmorising dialogue, an eclectic music soundtrack and a fistful of unforgettable scenes. The extras are good but slightly disappointing as I expected a 2 or 3hr original documentary covering all aspects of the film from how Irvine Welsh got his idea for writing the book to the reception of the film in the UK. Other than this gripe, it`s nice to see the film in its uncut form. A seriously good film that must be part of your DVD collection. Buy it now!